The Similan Explorer has been very popular in the last few years running some interesting 3 - 5 day trips including the Similan and Surin Islands, including a visit to the Moken sea gypsy village at the Surin islands. 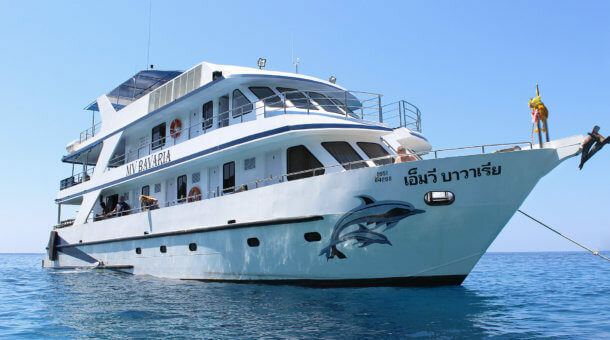 She takes up to 20 liveaboard divers with accommodation in a mix of double, twin and quad cabins. 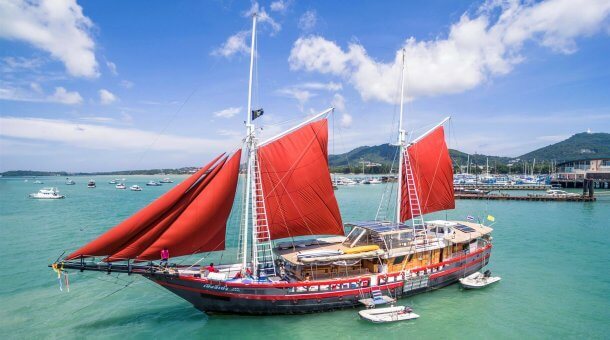 The boat has recently been refurbished, is very clean and tidy and is an excellent value low budget liveaboard for diving the Similans this season. Probably our top choice if you want a cheaper option on a very well run boat. Similan Explorer - Happy Divers! There are 2 double cabins on the upper deck, plus 4 twin cabins and 2 quad cabins on the main deck. All cabins have windows, are airconditioned and use shared bathrooms. There’s plenty of space to sit and relax around the boat at the bow, on the sun deck or on the shaded rear section of the upper deck. The Similan Explorer sets a high standard for a lower budget boat and is good value for money with 3 and 5 day trips at a good price. Between dives, you have plenty of opportunity to take a walk on some of the Similans or jump overboard and snorkel in the shallow waters of a quiet bay. The 5 day trips also include a land visit in the Surin islands to see the Moken sea gypsies. The dive deck is spacious and well organised. The Similan Explorer is also equipped with a 4m dinghy, and all of the most modern navigation and communication equipment. Explorer departs from the port of Thap Lamu, 90 minutes North of Phuket. Transfers in Khao Lak are included in the price. Transfers from Phuket can be arranged by taxi. 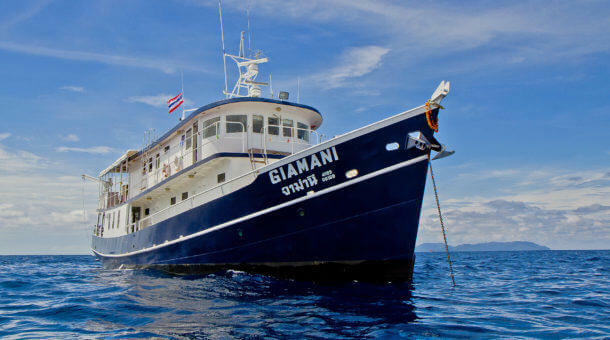 Rental equipment is provided by the Similan Explorer liveaboard. Rental price is 500 Baht per day for BCD/regulator (250 Baht per item per day) and 250 Baht per day for a dive computer. No charge for fins/mask/wetsuit. After pick up from your accommodation in Khao Lak you will go to the liveaboard office in Khao Lak to try gear before departure. Torches for night dives, no charge. 15 liter tanks 150 Baht per day. Nitrox is available on board @ 200 Baht per 12 liter tank fill or 1,500 Baht for 3 night trips, or 2,800 Baht for 5 night trips. PADI Advanced Open Water course is 8,000 Baht. PADI Enriched Air (Nitrox) course is 6,800 Baht. Note the boat has a strict rule – if you are only Open Water certified you must do the Adventure Deep Dive section of the Advanced open Water course (1500 Baht) or you can choose to do the whole Advanced Open Water course. Drinking water, coffee, tea, electrolyte drinks are included. Sodas are 30 – 40 Baht. Beers 70 – 80 Baht. Similan Explorer runs trips for 5 nights to the Similan Islands, Koh Bon, Koh Tachai, Richelieu Rock and the Surin Islands – including a visit to a sea gypsy village in the Surin Islands. There are also short 3 night trips including the Similans, Koh Bon, Koh Tachai and Richelieu Rock. Trips run through the season from October to early May. Note : This is an approximate itinerary. The 5 night trips include 18 dives at the Similan Islands, Surin Islands, Koh Bon, Koh Tachai and Richelieu Rock. Exact dive times will vary from day to day. There will be a visit to the Surin Islands and probably a beach in the Similan Islands also. Note : This is an approximate itinerary. 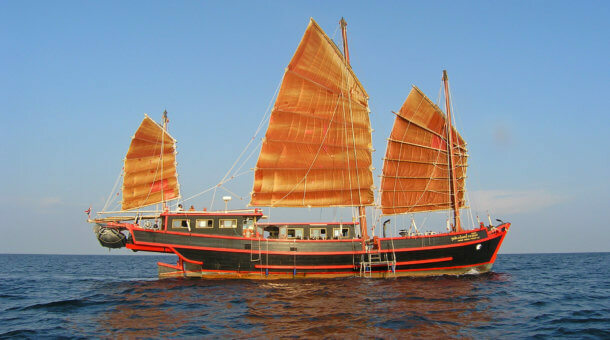 The 3 night trips include 10 dives at the Similan Islands, Koh Bon, Koh Tachai and Richelieu Rock. Exact dive times will vary from day to day. There will be a visit to a beach in the Similan Islands. Note 2 : Transfers to / from Phuket can be arranged at extra cost. Pick up @ Phuket Airport 1,300 Baht. Transfers from Patong, Karon, Kata beaches 2,200 Baht each way by taxi. We do suggest staying in Khao Lak if taking a trip on Similan Explorer.